Who doesn't love a good beef? Rocky versus Drago, Jay-Z versus Nas, Reese's Pieces versus my waistline. But the hottest heavyweight dustup has to be the battle between Apple (AAPL) and Facebook (FB). That's right, the iPhone maker and the largest social media network have a distaste for each other that shows no sign of improving. 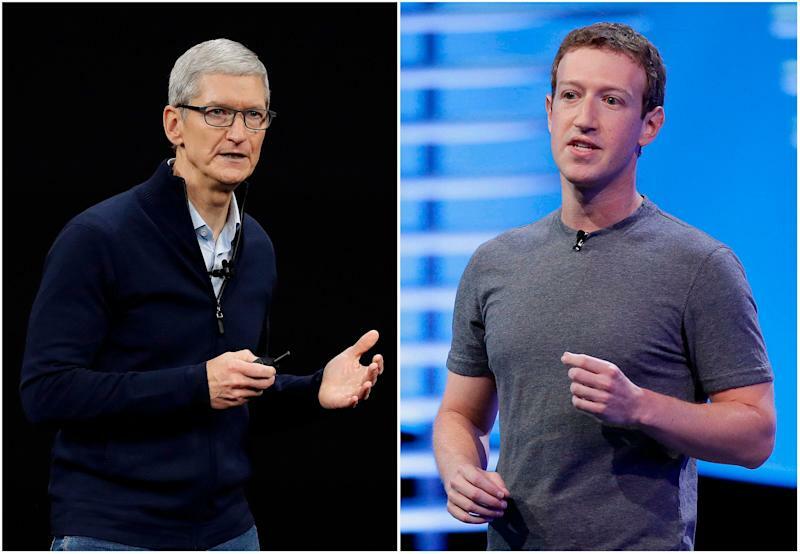 The latest spat between two of the world's most prominent tech companies follows revelations that Facebook was paying users as young as 13 to use an app called Facebook Research that gave the company an inside look at users' phones, right down to the network traffic. In other words, Facebook was able to get a look at virtually everything these users were doing. It's important to note that Facebook Research was labeled as a Facebook app during installation, and that users signed up for it, with younger users requiring parental consent. Still, Apple wasn't happy with the situation, and quickly pulled the plug on the app, rendering it useless. Apple has been positioning itself as the guardian of user privacy for some time now. The company's stance became a matter of national interest in the aftermath of the 2015 San Bernardino mass shooting. During its investigation, the FBI requested that Apple help break into an iPhone owned by one of the two shooters. Apple refused to cooperate with the government, pointing out that by creating a backdoor to crack one iPhone, the company would make nearly every other iPhone on the planet vulnerable to hacking. The FBI was eventually able to crack the iPhone's security on its own, though Apple has since further fortified its devices and operating system against hacking. TechCrunch, which was in attendance during the speech, quoted Cook as saying, “We believe the customer should be in control of their own information. You might like these so-called free services, but we don’t think they’re worth having your email, your search history and now even your family photos data mined and sold off for god knows what advertising purpose." Last year, when Cook was asked in an interview with CNBC how he would react if he found himself in Facebook CEO Mark Zuckerberg's shoes following the Cambridge Analytica scandal, Cook said he simply wouldn't be in that situation. Cook then went on to state that he believes privacy is a human right that Facebook is depriving people of. Which brings us to the latest battle between the tech giants. Apple has suspended Facebook's ability to use apps via the iPhone maker's enterprise development program. That's because when Facebook pushed out its user tracking app, it did so via the development program since such an app wouldn't be allowed in Apple's traditional App Store. But Facebook also wasn't supposed to push apps to consumers via the enterprise program, which was designed specifically for corporations to be able to push apps to their own employees. As a result, Apple cut off the app and the enterprise development program, leaving Facebook's employees in the lurch as they were unable to use genuine internal apps. It was later discovered that Google was offering a similar app in a similar manner that broke Apple's rules, which the search giant agreed to take down. It's also worth noting that Google (GOOG, GOOGL) and Amazon (AMZN) aren't immune from Apple's dislike of using consumers’ data for corporate gain. At CES 2019 in Las Vegas, Apple put up a massive billboard on a building saying that your what happens on your iPhone stays on your iPhone. The billboard just happened to overlook Google's enormous tent set up in the parking lot of the Las Vegas Convention Center. Apple's fight over user privacy is unlikely to end any time soon. And with Facebook pulling in record profit during its recent earnings report, neither is the social network's desire for user data.